Chinese or Oriental-style tents that look like a witches hat are beautifully simple in their design with an eye catching pointed roof. 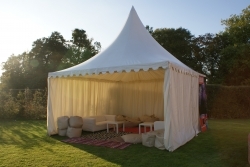 They can be used as an porch or entrance to a main marquee, as an extension to a house, the centerpiece to your event with a bar or as a chillout area with sofas, chairs low tables, cushions and bean bags. We can join these marquees together to create a larger space, they can have walls and lining options as well as special effect lighting.